How do you know you have the right Watt Christie? There were a lot of Watt Christies. How do you know which Watt Christie it was that gave all those false testimonies? Those are easy questions to answer. There was only one Watt Christie who had a daughter married to Sam Manus. Remember the testimony Manus gave? In that testimony, he said he was the son in law of the standing witness, Watt Christie. Manus gave the information to the Dawes Commission about Watt Christie's death. He also said he was Christie's son in law on this document. This means we need to know the name of the wife of Sam Manus so we can figure out "What Watt?". 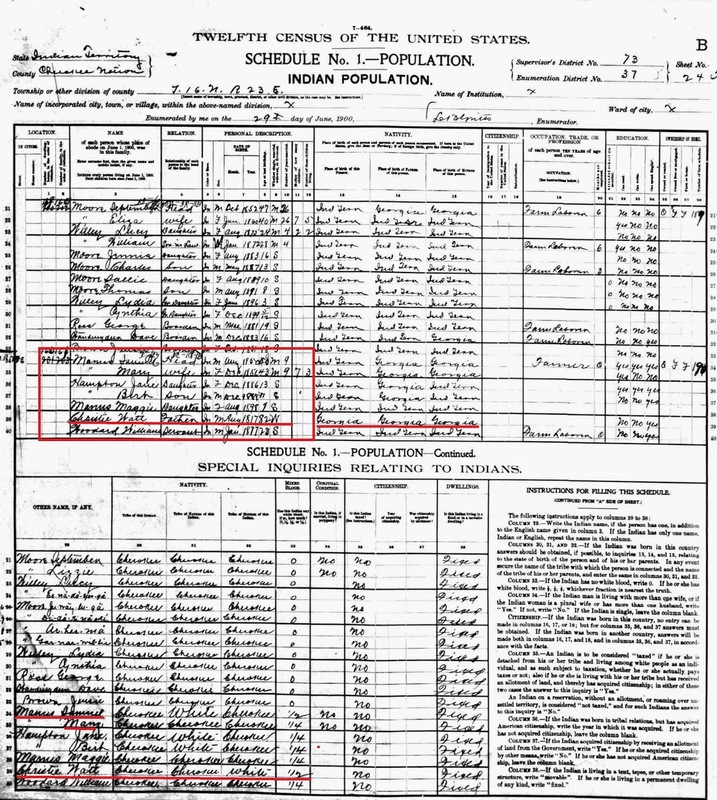 We find Sam Manus on the 1900 US Census and see that Watt Christie is found in the same household as him and his wife, Mary. Now we know Mary was the name of the wife of Sam Manus. 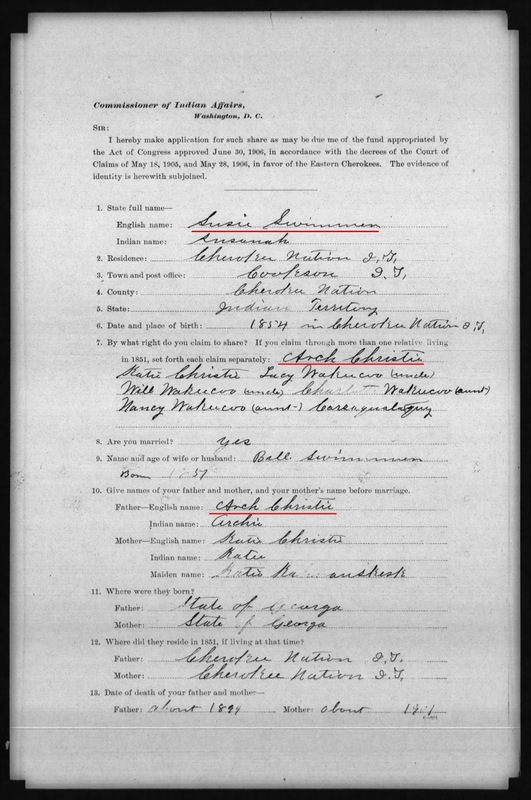 By looking up her Eastern Cherokee Application from 1907, we learn her father was Watt Christie and she was the widow of Sam Manus. This matches the information we've already collected from the Manus testimony, Watt Christie's death affidavit, and the 1900 census. 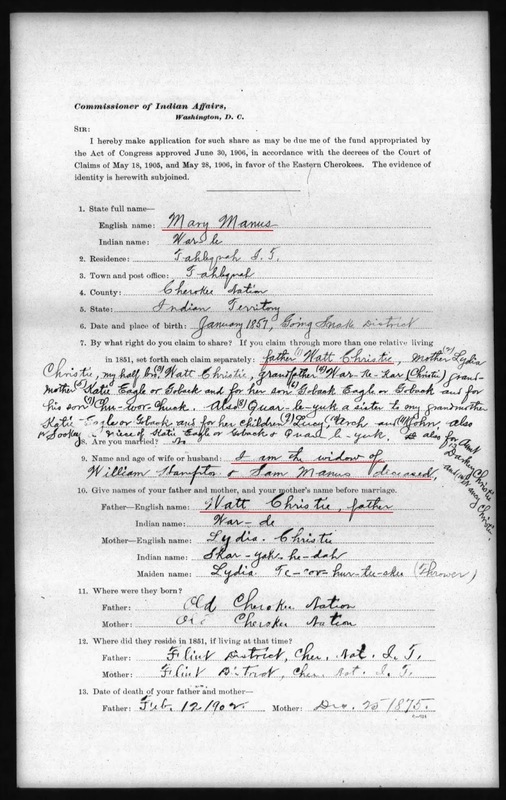 Page two of Mary's application is important because she gives the names of her siblings, grandparents and some of her aunts and uncles. 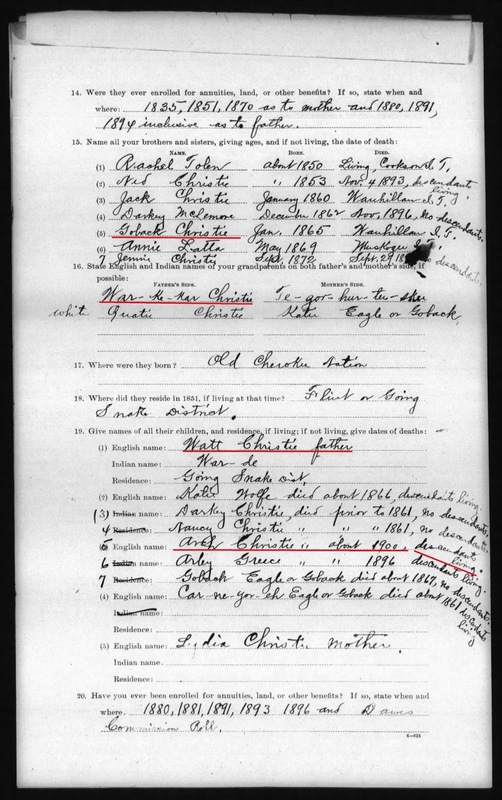 For this research, the people worth noting on this page are Goback Christie, her brother; War-ke-kar Christie and Quatie Christie (white), her paternal grandparents; and Arch Christie (descendants living), her uncle. To narrow down "What Watt?" 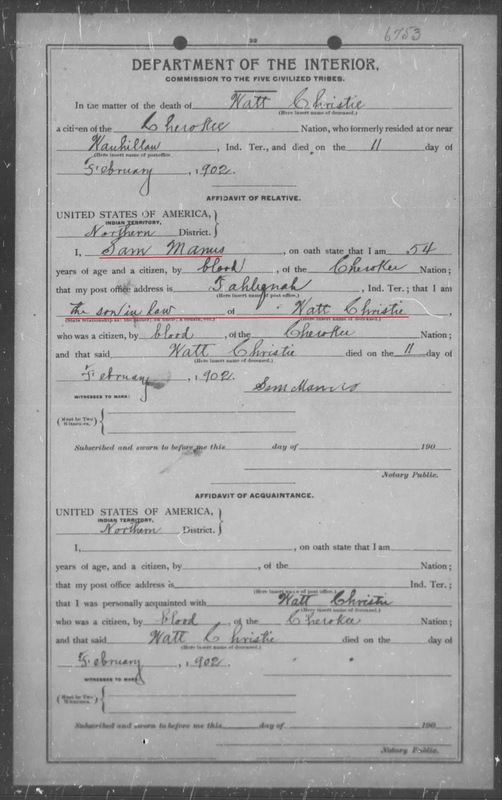 with clear and convincing documentation, it is important to identify the parents of the standing witness, Watt Christie. Mary Christie Manus said her father's parents were War-ke-kar Christie and Quatie Christie (white). To verify that, since they apparently had no living children in 1907, we need to check the application of another of their grand children. This is why Goback Christie, Mary's brother, is important. 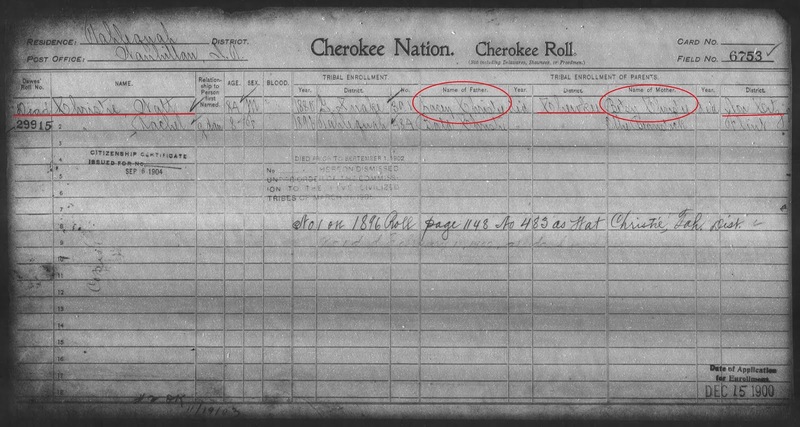 He was listed as still living at the time of the Eastern Cherokee applications, so we can pull his app and see what he reported. On page one (not shown), Goback said his father was Watt Christie. On page two, he reported Mary Manus as his sister; Wah-kee-coo Tah-lah-see-ni as his paternal grandfather; and Arch Christie as an uncle. Now we have verified Mary Manus and Goback Christie were siblings, the children of Watt Christie, standing witness. We have their grandfather's name reported as "War-ke-kar Christie" and "Wah-kee-coo Tah-lah-see-ni." Both report an uncle as Arch Christie. Because we want to clearly identify the father of Watt Christie, standing witness, so no one gets confused about "What Watt? ", now we want to check the Eastern Cherokee application of another grandchild, but instead of a sibling, we will check the application of a cousin to Mary Manus and Goback Christie. This is why the name Arch Christie, their uncle, is important to know. In Part 5 of the Standing Witness series, I included a page from the Drennen Roll used by Guion Miller. It shows the Fisher family and their living in close proximity to Lacy Christie. Arch Christie is the head of household in the family that is listed after the Lacy Christie household. It is partially covered by the arrow I put on the page, but you can read it. Beside Arch's name is the number 1828. This is a cross reference notation to an Eastern Cherokee application. By pulling up application #1828, we find it was made by Susie Swimmer. On the first page, she says her father is Arch Christie. Is he the same Arch Christie who was an uncle to Mary Manus and Goback Christie? We have to check page two of Susie's application to get an answer. Susie said her paternal grandparent was Lacy Wakeecoo and that she had an uncle named Watt Christie. The documention strongly points to a kinship between Mary Manus and her brother, Goback Christie, and Susie Swimmer. It appears they have the same grandparent and their fathers were brothers, which would make them first cousins. Names given, so far, for the father of Watt Christie and his brother, Arch, are War-ke-kar Christie, Wah-kee-coo Tah-lah-see-ni, and Lacy Wakeecoo. Because there is no "R" sound in the Cherokee language, phoenitically, War-ke-kar, Wah-kee-coo, and Wakeecoo are an extremely close match in the Cherokee language and are likely the same word. If we wanted to stop there, we would probably be safe in doing so. We have one name matching on all three documents, with one offering the name "Lacy." But, just for fun, because there is so much more documentation on this out there, let's throw in another application. This one is for a niece of Susie Swimmer. The link is not as clearly spelled out, so analytical skills become important. 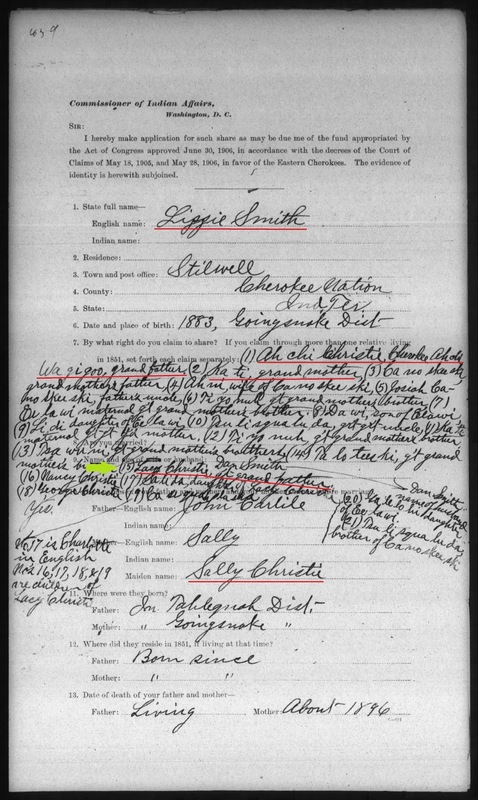 Guion Miller made a notation on the card that goes with the application of Lizzie Smith that connected her to Susie Swimmer (application #1828) as niece. It's important to remember Susie Swimmer was the daughter of Arch Christie (and his wife Caty/Katy.) 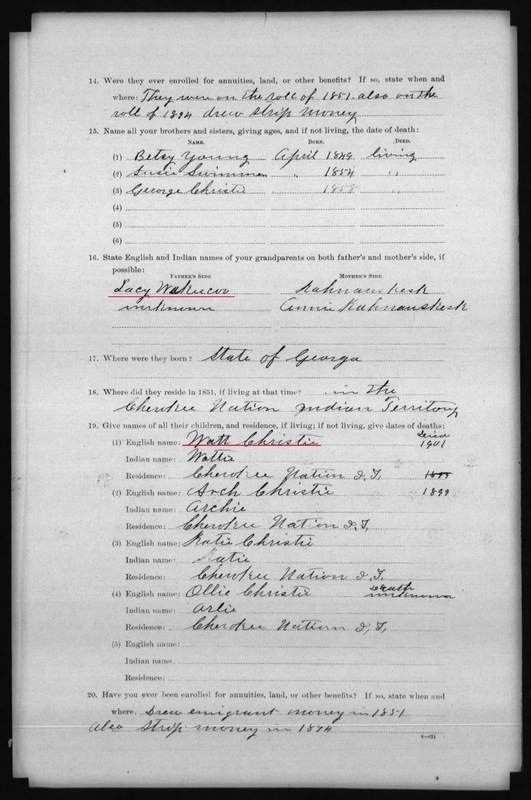 On page one, Lizzie Smith claims through (1) Ah chi Christie, Cherokee name Ahchi Wa gi goo, as her grandfather; and (2) Ka ti, her grandmother. Also notice (15) Lacy Christie, great grandfather. On page two, Lizzie's maternal grandparents are listed as Arch Christie and Katy. This is a match to the parents of Susie Swimmer. Sally Christie, the mother of Lizzie Smith, was Susie Swimmer's sister. Now we have the names given for the father of Watt Christie and his brother, Arch, as War-ke-kar Christie, Wah-kee-coo Tah-lah-see-ni, Lacy Wakeecoo and Lacy Christie. 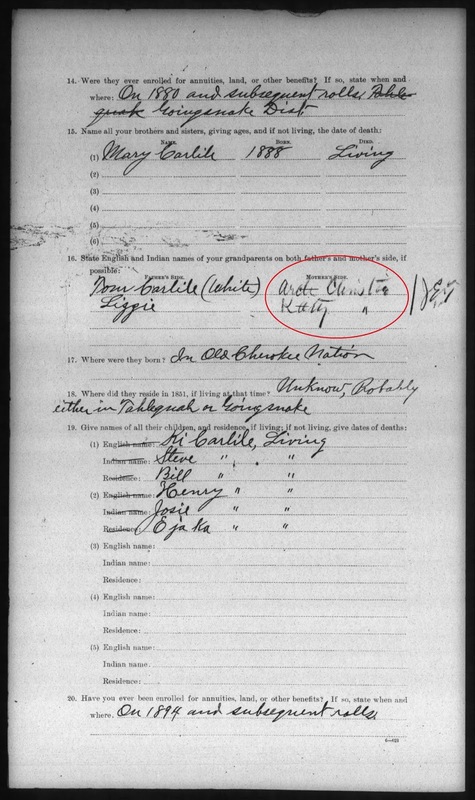 We could continue on, looking at more applications and recording the variants of names given for the father of Watt Christie and his siblings, but because we have additional information giving us the name of the father, it is not necessary. The Watt Christie, who was the standing witness, made an application to the Dawes Commission in 1900. 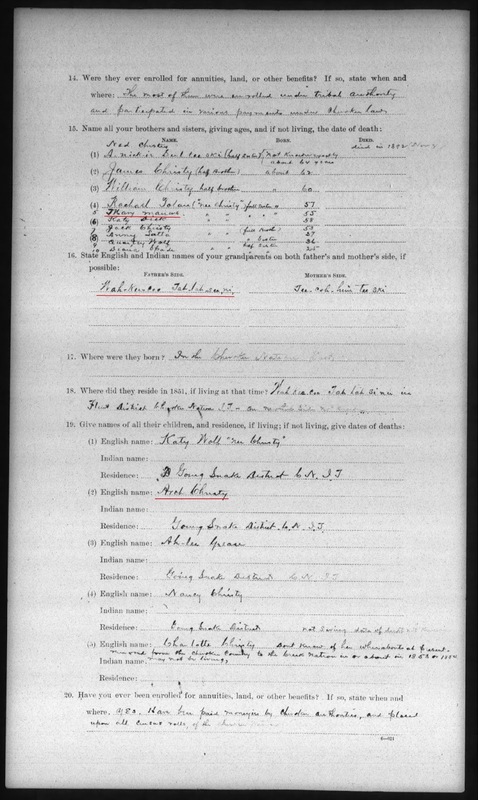 He was not included on the final roll because he died before September 1, 1902, but his census card from that application is still valuable because of the information it includes. 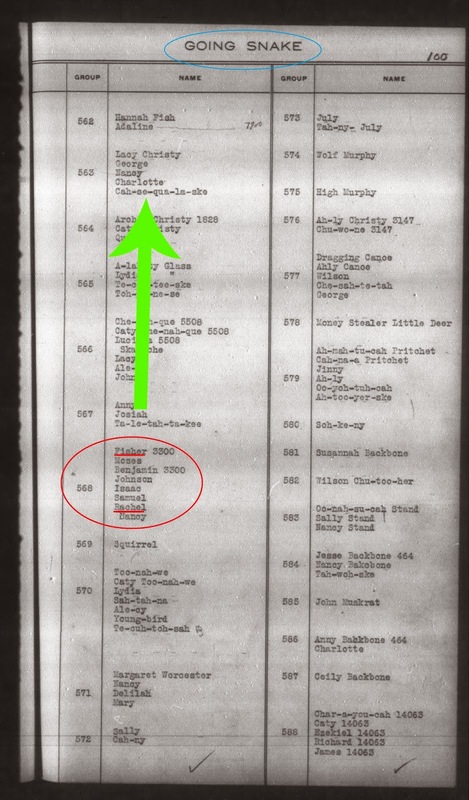 The card says Watt Christie's father's name was Lacey Christie, Cherokee, and Betsy Christie, a non-citizen. So "What Watt?" It is the Watt who was born about 1817 in the old Cherokee Nation, in what became the state of Georgia, and who lived a very long life, fathering many children, including the famous Ned Christie. Per the documentation, the father of standing witness,Watt Christie, was Lacy Christie in English, Lacy being short for Talaseeni. Did you get that? Watt Christie, the standing witness, was the son of LACY CHRISTIE. Note: As I understand it, there are some who either won't do their own research or can't do their own research and they wrongly claim an Edward "Ned" Christie was the father of Watt. This information comes from the book, "The Killing of Ned Christie", Ned being the son of the standing witness, Watt Christie. The documentation above clearly shows the book is in error, therefore anyone who quotes the information from the book is in error as well. If my saying this isn't enough, I would urge readers to contact Roy Hamilton (*1), who has worked for the Cherokee Nation in History and Preservation, or Gene Norris (*2), senior genealogist at the Cherokee Heritage Center. They have done extensive research on the Christie family and their conclusion, after their research, is in agreement with my conclusion after my independent research - Lacy Christie was the English name of the father of Watt Christie. Now, why so much emphasis on the name of the father of the standing witness, Watt Christie? Stick with me for the next post in the series, Standing Witnesses, and you'll find out. *1 - In his review of the book, The Killing of Ned Christie, found on Amazon.com, Hamilton says, "Some names are found to be in error such as refering to Ned's paternal grandfather as Ned, his name was Lacy (in English)"
*2 - Information about the Christie Cemetery, compiled by certified genealogist, Gene Norris, states, "Watt Christie was the son of Lacy, “Wa-ki-gu Da-la-si-ni,” and Betsy Christie."